It's beginning to look a lot like Christmas, so Sweden is getting into the spirit of the season by cranking up the yuletide sounds of... Anvil? That's right, Canadian heavy metal legends Anvil are currently the focus of a Facebook campaign that hopes to have the outfit's 1982 cut "Metal on Metal" top Sweden's singles chart this Christmas. Perhaps inspired by a successful push in the UK last year that found Rage Against the Machine's "Killing in the Name" taking the top Xmas spot instead of an insipid X Factor-spawned pop star, the Anvil campaign also aims to quash the pop set. Blabbermouth explains that "Anvil Aid," which was launched yesterday (December 15) "out of love for and devotion to the band," has already pushed the tune well into forefront. "Metal on Metal" has reportedly sold over 7,000 downloads on the Swedish iTunes store so far, placing it at the top spot in Sweden (seriously, have a look). The campaign ends December 22. 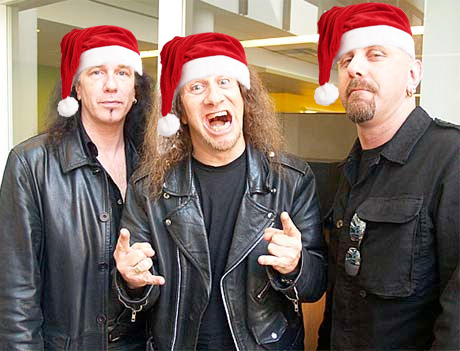 Here's hoping the thrash pioneers help the country get through the holidays. It would be just one more oddball moment in Anvil's comeback phase. While Canadian Anvil fans won't be able to help out their Swedish brethren, since iTunes sales are country-specific, they can probably raise their devil-horned fists in solidarity with well-worn vinyl copies blasting in the background. And let us remind you, while the new Anvil disc won't be under you tree in time for Christmas, the band will be issuing the LP sometime next year.